Tii's families of fiber optic products are designed to provide cable management and connectivity between the OSP fiber drop and customer fiber drop. Our compact, craft-friendly enclosures are available for use in both single-family units (SFUs) and multi-dwelling units (MDUs). With the recent acquisition of Frederick Fiber Optics, Tii now has the capability to manufacture a wide variety of high performance fiber optic cable assemblies, wall and rack mounted fiber distribution panels, and miscellaneous fiber accessories and services. Tii's cutting edge wall mount fiber distribution units are designed to support patching and splicing in one unit. 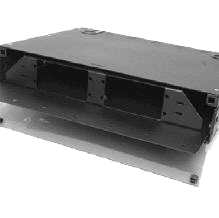 Tii's rack mount fiber distribution products include termination panels 19” or 23” rack mount fiber distribution unit designed to support both patching and splicing in one unit. Tii’s custom fiber patchcords are configured to meet your individual requirements. Custom assemblies made to order using the latest technology, premium materials and proven processes available. Specifically designed for Telco Headends, Central Office, and other dense fiber optic networks we offer the TSL and SPS series LGX® compatible patch and splice panels. Tii's Fiber Interface Devices (FID) are compact enclosures designed to provide a demarcation and transition point between fiber drop cable and the customer premise fiber cable.